asd on WCB: We're Hosting Again! Save Your Fork... There's Pie! 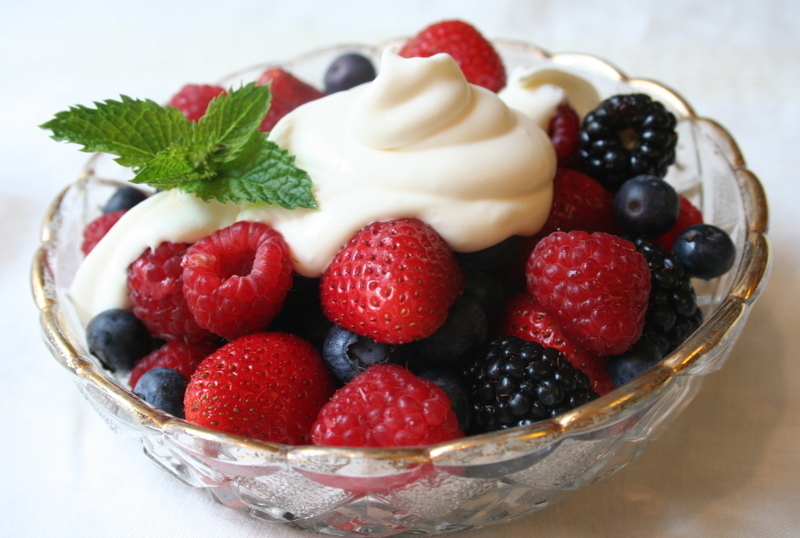 You don't have to put Grand Marnier in your whipped cream, vanilla will do nicely. But, the orange liquor certainly made my day. By the way, please notice the lovely heirloom bowl that my fabulous mother-in-law, Bunty, gave me. I treasure it. 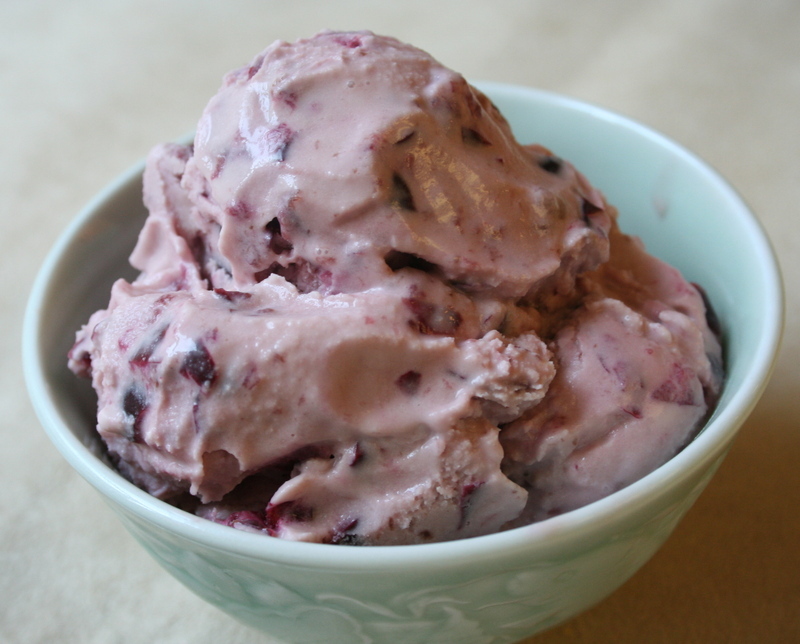 I promised a friend that I would make her some sweet cherry ice cream with the fruit I harvested and froze a few months ago. This was my opportunity to use my Donvier Ice Cream maker, which is probably 15 years old. Once a trendy device, it's been surpassed by newer ice cream makers. But, as I don't make ice cream very often, I find that the old Donvier works just fine for my purposes. The recipe is very simple, just cream, eggs, sugar, chopped sweet cherries, and vanilla. Some people like almond extract with cherry ice cream, and that is a good pairing. But, I prefer vanilla because it tastes better to me, and doesn't overwhelm the cherry flavor. Vanilla pods are actually the fruit of an orchid, which is a pleasant thing to consider. However, that wonderful vanilla taste and aroma happens only after the vanilla pods are cured for several months. This salute to vanilla is perfect for Weekend Herb Blogging, which is being hosted by (drumroll, please) our fearless leader, the noble Kalyn herself, who created WHB. Go to her site, Kalyn's Kitchen, for a recap of herby recipes from bloggers around the world, probably on Monday. 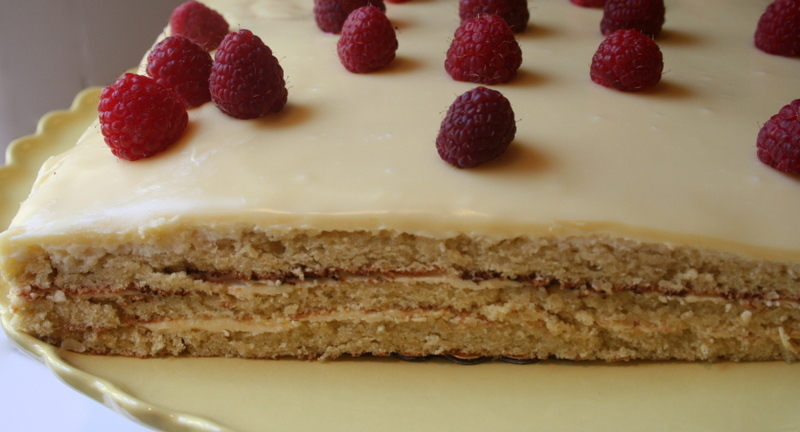 Another Daring Baker Challenge, and it introduced me to a famous cake I never knew existed! 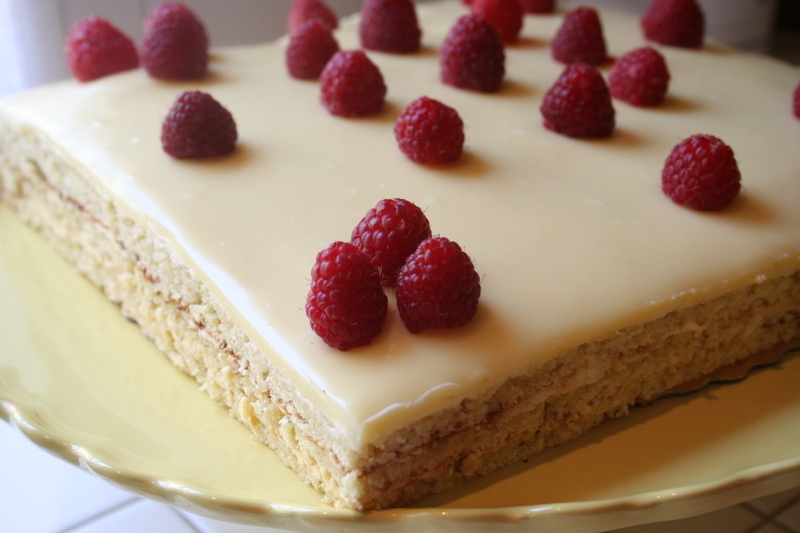 The Opera Cake was first introduced to the world in 1903 and has been quite popular since then. But, I've never heard of it until now. Maybe our noble founders of Daring Bakers, Ivonne of CreamPuffs In Venice, and Lis of La Mia Cucina, assisted by Fran at Apples Peaches Pumpkin Pie and Shea at Whiskful, knew there were people like me, and wanted to enlighten us. Well, I'm very happy that they chose this recipe. I admit that my first glance at the recipe made me groan. It was so long and I immediately thought...too complicated. Then I remembered that a long recipe can actually be easy to make, because everything is spelled out clearly. And so it was. 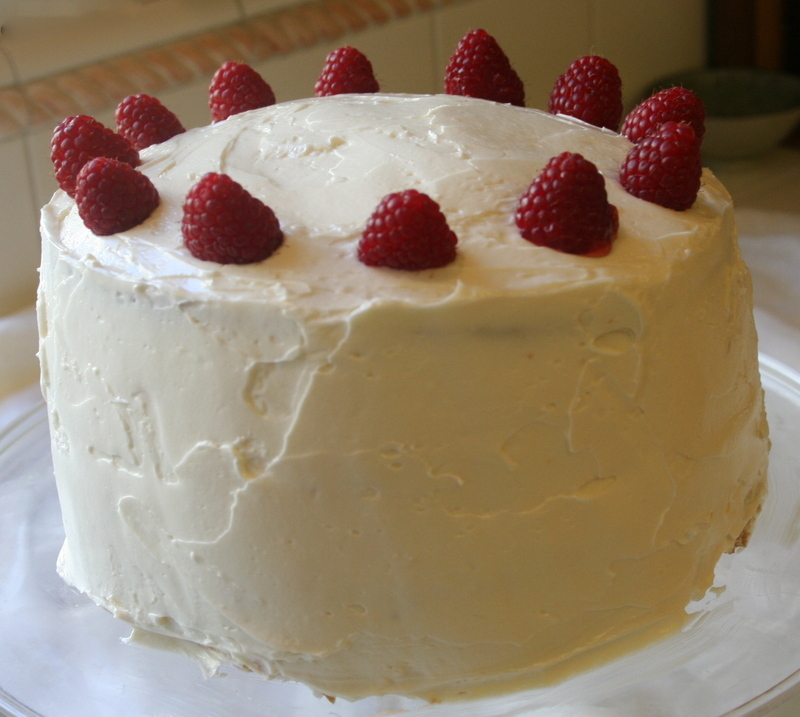 I made this cake over a period of several days and easily assembled it on Mother's Day, for a party I attended. This lovely recipe is dedicated to Barbara of Winos And Foodies, the driving force behind LiveStrong Day. If you haven't already done so, stop by her blog and see beautiful, funny, and inspiring photos and stories. I love cupcakes, but sometimes there is too much of a good thing. I made 40 cupcakes on Friday, for Lizzie's birthday. Lizzie, my friend Nancy's daughter, was all about cupcakes for her party this year. Fortunately, a recent article in Food & Wine magazine detailed how to make the perfect cupcake. Mine weren't perfect, but they were pretty good. I made a big vat of buttercream, and used it to make strawberry, peanut butter, and Oreo cookies and cream frosting. And of course, I made chocolate frosting too. I worried that I'd be gobbling all of Lizzie's cupcakes, but hours of inhaling the buttery, sugary fumes made me sick to my stomach. 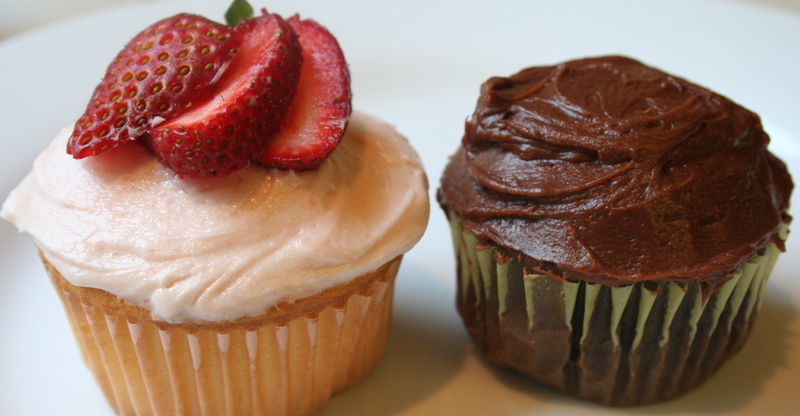 I never thought I'd say this, but it will be a long time before I crave another cupcake. Yes, it's another Daring Bakers Challenge. 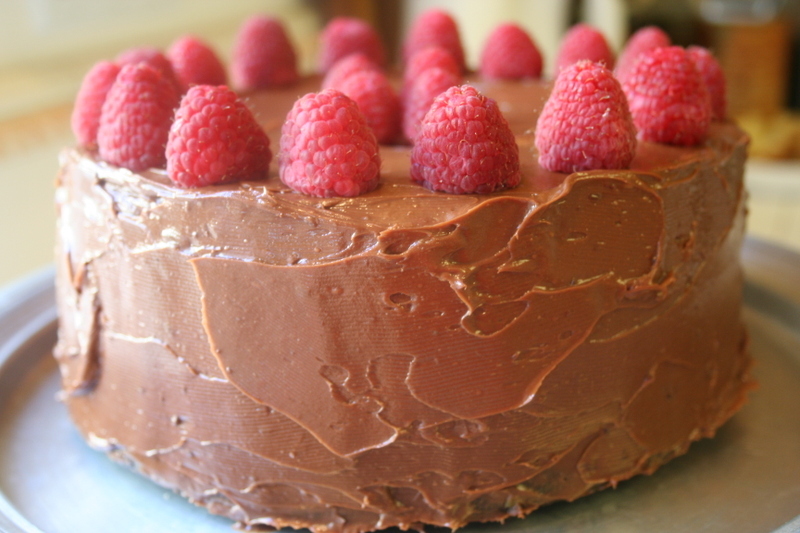 This time we have Dorie Greenspan's recipe for Perfect Party Cake. I wondered if it would live up to it's name, and it most certainly did. I baked it for Easter dinner at my friend Nancy's house, and it was a huge success. It's always heart warming when people nearly give you a standing ovation. The cake was really a birthday cake for her mom, Katherine, and it cut beautifully and tasted...well, perfect. The recipe this month was chosen by the wonderful Morven, of Food Art and Random Thoughts, and I thank her very much for choosing it. I'll be making this cake a lot. I think it is, indeed, the perfect party cake. The recipe was simple to make and, and it provided me with lots of yummy batter and frosting. Enough to "sample" before I baked the cake and frosted it. I love raw cake batter more than when it's cooked, and drove my mother crazy as a child, by standing at her arm, begging for it as she tried to fill her cake pans. I'm glad I showed restraint and baked my layers, resulting in tender, yet resilient layers that easily handled being split in half before being filled and frosted. That part went OK, but, as usual, I had some problems. I'm addicted to Pepperidge Farm Bordeaux cookies. 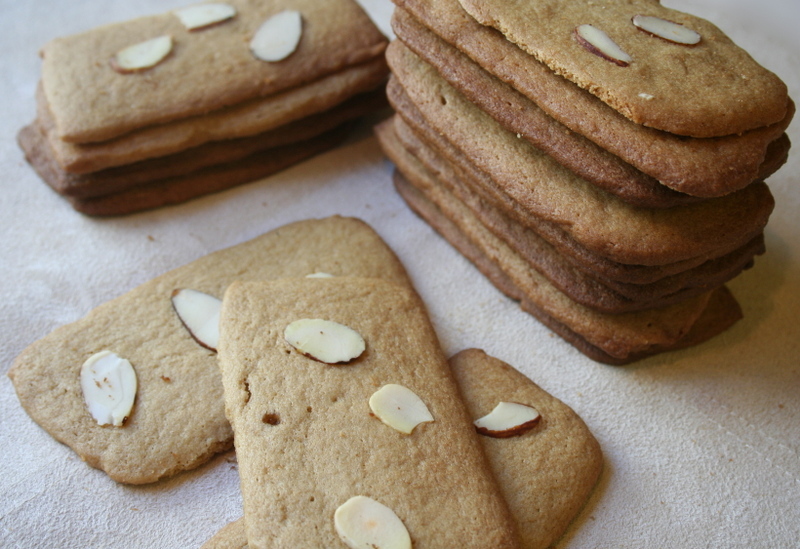 They're thin and crisp, with a sweet caramel taste, perfect with a cup of coffee. I walk quickly past them, eyes averted, when I'm in the grocery store. "Don't look, don't look," I say to myself. When I saw these cookies in Martha Stewart Living, they reminded me of my favorite, so I had to make them. Basically, these are a shortbread dough, using dark brown sugar instead of white, which changes the texture of the cookie and provides a caramel flavor. The dough is frozen and later sliced for baking, which I find very efficient. It took a few batches before I figured out how long to bake them. The recipe says 10 minutes, but they were too dark when I left them in the oven that long. So, they need to be monitored carefully. I found that 9 minutes was perfect for me. The resulting cookies weren't exactly like the Bordeaux, but they were close. Crisp, not too sweet, with a delicious caramel flavor, they seemed to taste better and better with each cookie that I ate. For years I heard about Greek yogurt, but never found it in the grocery store. Perhaps it was there all along, but I never saw it among the dizzying assortment of yogurt in the dairy case. Then one memorable day, I found it. I bought a carton and immediately fell in love with the thick, smooth texture, unlike yogurt thickened with gelatin or pectin. It's my understanding that Greek yogurt is made by boiling sheep or cow's milk, until the water content in the milk is reduced. This concentrated milk eventually becomes a marvelous yogurt, so delicious it's one of my favorite things to eat for dessert. I'll take a carton of it over ice cream anytime. I like to tell myself that it's much healthier for me, but truth to tell, Greek yogurt can be high in fat and calories. But, I don't care. 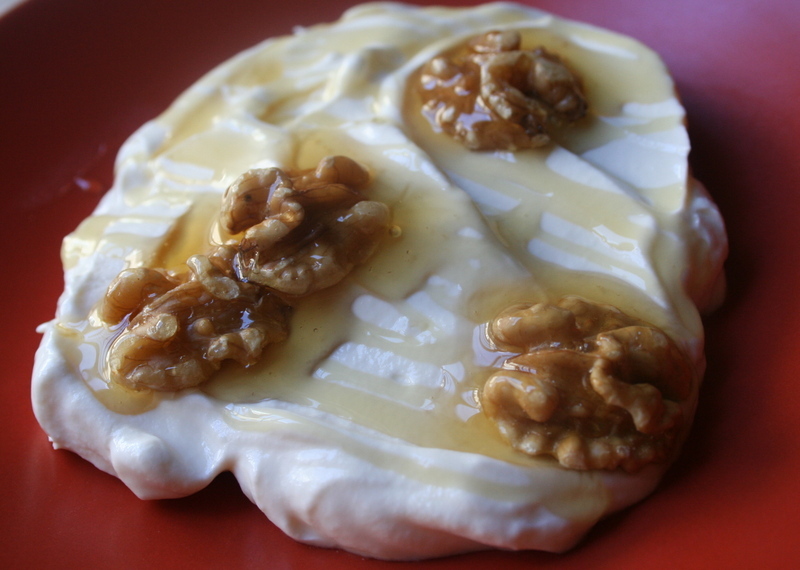 There's a split of opinion among Greek yogurt fans about whole milk versus skim milk varieties. Count me in the whole milk faction, as the skim milk version tastes grainy to me. But, I know people who swear that Fage and Trader Joe make a skim milk product equal to that made with whole milk. Well, I'll never give up my whole milk Greek yogurt. Never! Never Throw Away Your Pastry Scraps. Maybe some of you remember the last Daring Baker Challenge with the Milk Chocolate and Caramel Tart? I saved my scraps of leftover chocolate shortbread crust and stashed them in the freezer. Since then, each time I got ice cubes, the scraps seemed quite forlorn, pining to fulfill their culinary destiny. So, today I used a small amount to make two tartlets. I like this shortbread dough because it tastes very good, and can be pressed into a tartlet or pie tin with your fingers, like Play Dough. No rolling required. After baking them for about 30 minutes at 325 degrees, I filled them with Greek yogurt (after they cooled, of course). 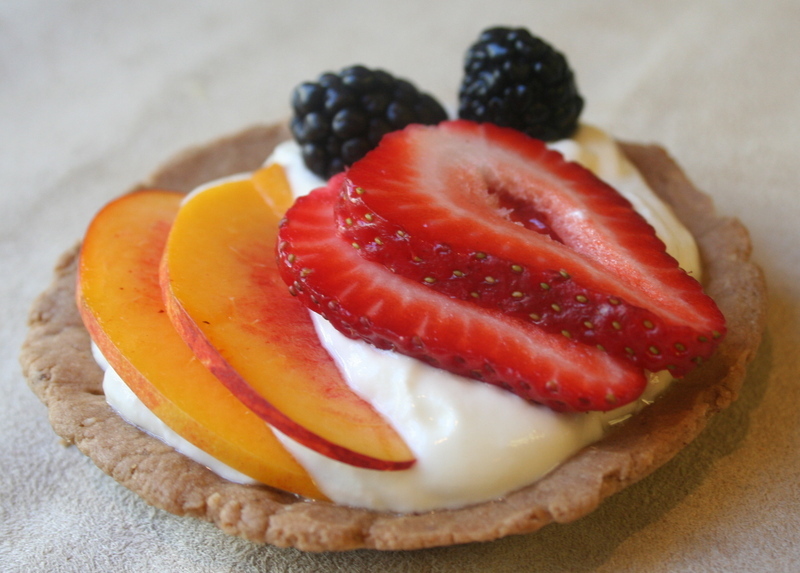 Then I scattered some berries and sliced nectarines on top of the tartlets. They seemed a bit healthy, with the yogurt and fruit. Although the crust does contain butter, it required barely two tablespoons of the dough to make each tartlet. Most important, they were delicious. 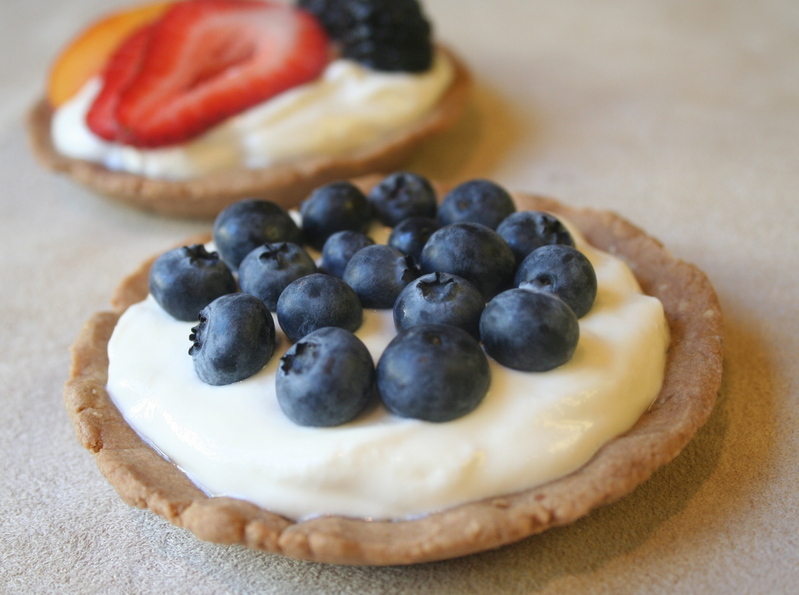 Greek yogurt, which I adore, makes a good substitute for pastry cream. And making just two tartlets kept the calories under control. Note to self: Buy some of those fancy fluted tartlet pans. Daring Bakers: Heart Attack On A Plate. Last month the amazing Yvonne at Creampuffs In Venice asked me if I would like to join the Daring Bakers. You've probably read the exploits of these wizards of dough, masters of pastry, empresses of batter......well, I'm spinning out of control here. Each month they set themselves a baking challenge and their efforts are marvelous. Clearly, I'm not worthy, but I was so happy to join them, with the hopes that trying to keep up with them would stretch my meager baking skills and give me an excuse to bake something complex and decadent. And that's exactly what happened with my first month's effort, Darkest Chocolate Crepe Cake. 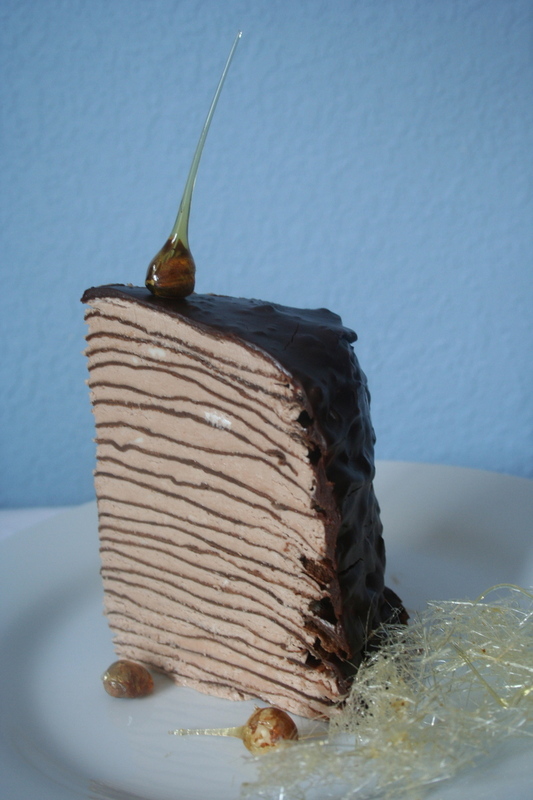 I remember seeing this crepe cake featured in an issue of Martha Stewart Living, and toying with the idea of making it. But, I never did. So, I was quite happy when Brilynn at Jumbo Empanadas chose it for this month's challenge. Little did I know what a challenge it would be. Martha dear, I love you--but this was a difficult cake to make, and I think your recipe was a bit confusing. I don't bake many cakes, and that's probably no surprise to anyone looking at my haphazard frosting application. However, that's OK. As the master cake artist Glenna reassured me, it proves that the cake is homemade. I made this terrific Ina Garten recipe in honor of my cousin Charmayne and her handsome fella, Julius, who came to dinner on Sunday. Charmayne and Julius just moved to Sacramento and are in the exhausting process of unpacking all their worldly goods and moving into a new apartment. Therefore, I felt a cake was in order. Ina Garten swears this is one of the best cake recipes she's ever made. And it lived up to her praise. It was delicious and easy for my rusty cake baking skills. I made it while I was having one of my "tired" periods and the one bowl method was greatly appreciated. The cake has one cup of freshly brewed coffee in the batter and a tablespoon of instant expresso in the frosting. As Julius noted, it cut the sweetness nicely, but didn't announce any presence of coffee in it.